Theater in the Now: Review: Say Uncle! Sketch comedy is like that bridge between theater and improv. Comedians being funny in a scripted evening in front of a live audience where anything can happen. Forty years and counting, many aspire to "Saturday Night Live" level but if you can't quite get there to see it, I might have a viable alternative for you. Presented at The PIT Loft, Uncle Function offers an evening of theatrical sketch comedy that is likely to leave you in stitches, at times. 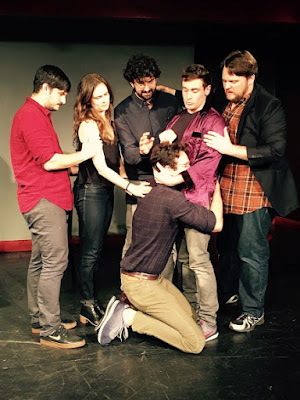 Uncle Function is an ensemble that features the comedic talent of Chris Cafero, Russell Daniels, Alex Fast, Jessica Frey, Douglas Goodhart, and Gianmarco Soresi. Founded by infamous theatrical producer Ken Davenport, this group brings an hour-long evening that mirrors the expectancy of any sketch comedy troupe. The night started off on a super high note with back to back theater inspired sketches, the second of which was the strongest of the evening and quite possibly one of the funniest sketches I've seen in any medium in quite some time. The premise was simple. A borough theater company begin their rehearsals for their production of Fiddler on the Roof. When a heroic Rabbi saves their production by funding their Kickstarter, he is granted laughable permission to update the text to fit the more "traditional" views of Judaism. And the result is epic. It's audaciously racy that stylishly comments on religion, theater, and the dreaded crowdfunding. From here on out, the night provides some fluff scenes before ending strong with three sketches. These included a creepy yoga instructor that left you with the best punch line, an abysmal court stenographer, and a group therapy session for those addicted to pop culture references. The Uncles, as they call themselves, incorporated an array of recurring jokes, including pizza tacos, old headshots serving as all paper products, and common last names that made their way into many of the sketches. It allowed a nice common through line for those paying close attention. With a strong sense of vision, there was a connective tissue that made everything work cohesively. Uncle Function features a strong sextet that tackles an assortment of roles, each taking a moment in the spotlight. That being said, it's a pretty well-balanced ensemble with a mixed comic types, though some similar types fought for stage time. The biggest presence, on page and stage, was Gianmarco Soresi. Often playing the straight man in the scenes, Soresi has a strong sense of timing and storytelling in short form. Soresi also happens to be the scribe of that epic Fiddler sketch. Also filling the straight man quota was Chris Cafero, though when he took on the touchy-feely spiritual yoga teacher, a playful side of Cafero came out. Russell Daniels stole the show as the slow-typing stenographer who had trouble keeping up with the trial, interrupting with hilarity. There’s stiff competition in the comedy world but if you’re looking for some up-and-comers that will make you laugh, Uncle Function is here to please. The Uncles may have had some wiffs, but when they swung for the fences, they hit some monster homers.